You'll find yourself reaching for Speaker time and time again as both a quick fix for overly clean instrumentation and an overt special effect. The latest quirky curio from AudioThing is an overdrive and speaker emulation plugin designed to make "any audio source sound as if it's being played on an old radio" and "emulate a cheap guitar cabinet or give harshness to any sound". The proposition is pretty simple, then, and that's reflected in the controls, which are minimal and straightforward. Distortion is ramped up using the Drive and Gain knobs - the first sets the depth of the overdrive, the second the gain level, from -inf to +12dB. The Compressor button switches in a fixed compression circuit for volume levelling, and further dynamic control is available in the shape of a hard clipping limiter, oddly hidden away in the 'More' menu, alongside the Registration, About and Online manual options. The Speaker Model switch offers a choice of Bass, Mid and High speaker models, each one using distortion and filtering to narrow the signal down to the stated range (although Bass really focusses on the low mids). 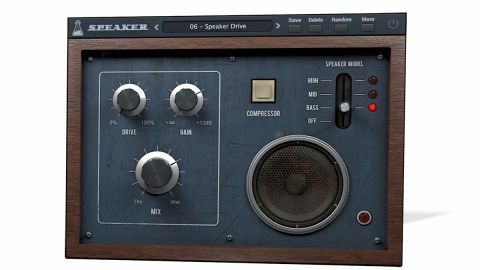 The emulation is fabulously dirty and lo-fi, and although you'd think the lack of adjustable parameters would severely limit its usefulness, Speaker 'just works'. The Mix control, used to balance the dry and wet signals at the very end of the path, is all you need to dial in the dirt, adding as much or as little grit as required to drums, basses, guitars, vocals and synths. There's also fun to be had shaking up the five controls with a click of the Random button. Our only criticisms of Speaker relate to the GUI: the positioning of the limiter is weird, and the icon for the bypass button is actually that of a power button, lighting up to make it look the plugin is on when in fact it's off. In terms of the things that really matter, though - sound, ease of use and value for money- AudioThing's cheery little gadget gets everything right.